“Tajima-gyu” cows originally came from Tajima, a mountainous region with few open fields on the Northern side of Hyogo Prefecture facing the Sea of Japan. Its roots go back a long way, and descriptions of Tajima-gyu can be found even in the “Shoku Nihongi” (lit. The Continued Chronicles of Japan) which was written at the beginning of the Heian Period (circa 794 onwards). This breed of cow is of small build and has a tight, firm body. In olden times, it was highly valued since it could move in small sharp turns in narrow-ledged fields for farm work or for carrying heavy loads. The qualities unique to Tajima-gyu are owed to the soft meadows and mineral-rich water of Tajima, a region characterized by big differences in daytime and nighttime temperatures and exposure to night dew. Tajima-gyu cows have a thin, resilient skin, hair soft as down and firm, tight muscles. Apart from its flavorful meat, a feature of this breed of cattle is that it has thin bones and little subcutaneous fat, which means that it has a high percentage of edible parts. Without doubt, this breed is endowed with qualities that make it ideal for eating. Generations of docile, well-shaped and good-natured cattle have been born from the Tajima-gyu lineage, and have come to be bred and reared not just in the Tajima region but throughout Hyogo Prefecture as well. 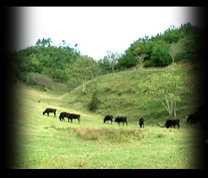 Tajima-gyu cows are genetically strong and are used as the “motoushi” or purebred seedstock cattle in the breeding of Wagyu cattle nationwide. Of these, the strain of Tajima-gyu cows having particularly consistent qualities are called “Tsuru”, and cattle born from this line are called “Tsuru-ushi” cows. There are currently three sub-strains of Tsuru-ushi cows, “Atsuta-zuru”, “Fuki-zuru” and “Yoshi-zuru”, and the outstanding dominant features of each strain have been inherited through successive generations. 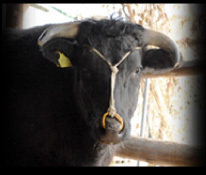 Because Tajima-gyu cows are treasured as “motoushi” or purebred seedstock cattle, they have been used in crossbreeding. As a result, their genes are inherited by brand name livestock in the various regions of Japan. However, mating and crossbreeding between Hyogo Prefecture produce Tajima-gyu and other breeds of Wagyu cattle in other prefectures is avoided even now to protect and maintain completely pure blood lines. Cattle are supported by the love and pride of farmers trying to uphold important heritages—“Tajima-gyu” and “Kobe beef.” We expect these world-class standards of quality to be handed down from generation to generation in the future, too.